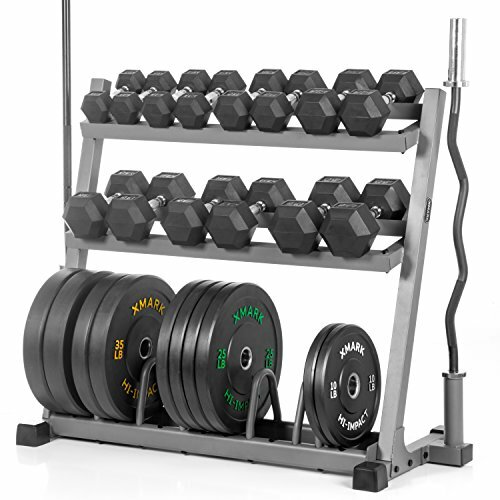 Included in the POWERHOUSE package is our XMark Dumbbell and Plate Weight Rack With Dual Vertical Bar Storage, the XMark VOODOO Commercial 7' Olympic Bar with 1500 lb. Weight Capacity, a 28mm 400 lb. weight capacity Olympic EZ Curl Bar, 350 lbs. of XMark premium quality, rubber coated hex dumbbells (7 pair: 10, 15, 20, 25, 30, 35 and 40 lbs.) and 280 lb. set (2 Pair 25 lb., 1 Pair 10 lb., 35 lb. and 45 lb.) of XMark HI-IMPACT low bounce 90 percent virgin rubber black Olympic bumper plates with heavy duty curved stainless steel flange rings. Spring collars are not included in this package. The XMark Voodoo 7' Olympic curl bar and our Olympic EZ curl bar both sport a black manganese phosphate shaft. Manganese phosphate coatings are the hardest, while providing unbeatable corrosion and abrasion protection. Protect your investment by taking a couple of minutes by wiping down your bar regularly with a light coat of WD-40 or a 3-in-1 oil. Products, as this, weighing over 150 lbs. ship with a freight carrier. We offer curbside delivery only and a signature is required. An agent with the freight carrier will contact you to schedule a delivery appointment, thus a valid phone number is required. If the freight carrier is unable to contact you at the phone number provided and a freight shipment is returned, you will be responsible for freight charges both ways, in addition to a 15% restocking fee. Freight shipments are delivered by semi-trailer trucks. It is the customer's responsibility to ensure there is enough clearance for delivery.